The Cardston Alberta Temple is the eighth constructed and sixth operating temple of The Church of Jesus Christ of Latter-day Saints. 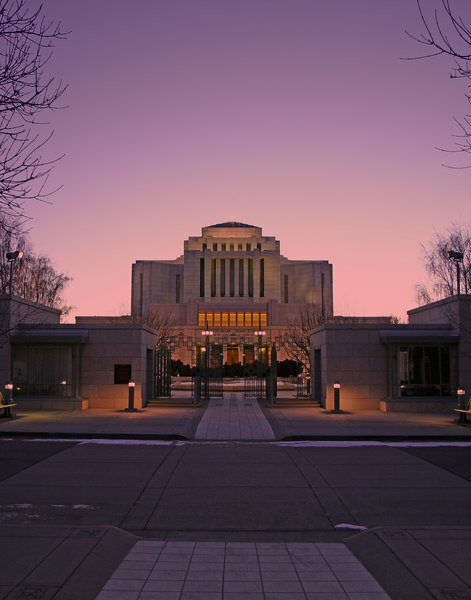 Located in the town of Cardston, Alberta, it was the second LDS temple built outside of the United States, the first one being the Laie Hawaii Temple (Hawaii was not yet a state). It is one of only nine LDS temples that does not have an angel Moroni statue, and one of only three that was constructed without spires in a manner similar to Solomon's Temple (the other two were the Laie Hawaii Temple and the Mesa Arizona Temple). During the mid 1800's, the Latter-day Saints were experiencing persecution in Utah. President John Taylor asked Charles Card, a saint from Logan, Utah, to go to Canada and seek a place of refuge for the Church. In 1887 the first eight LDS families set up camp in an area scouted by Card. Other families began to arrive, and the town of Cardston was planned in a grid fashion. Irrigation and plowing began. In 1888 one of the Twelve Apostles, John W. Taylor, visited the Saints in Canada and prophesied that a temple would be built at the very place he was standing. Two years later, President Wilford Woodruff instructed Charles Card to buy around 20 thousand acres of land surrounding the town of Cardston. The Saints flourished in the area, because the Canadian government was accepting of their religion, and by 1895 the first stake outside of the United States was organized in Cardston. In 1912, President Joseph F. Smith sent Presiding Bishop Charles W. Nibley to Canada to recommend the best site for a temple. Nibley returned with photographs of four possible sites. President Smith unknowingly selected the same site Elder Taylor had dedicated over twenty years earlier. On June 27, 1913, the building of the Alberta Temple was announced. A groundbreaking ceremony followed the announcement, and construction began almost immediately. The design of the Alberta Temple was the first that did not include any towers or an assembly hall. The granite for the temple was hand-hewn from quarries in Nelson British Columbia. On August 26, 1923, the temple was dedicated by President Heber J. Grant. The temple has since undergone two remodels and re-dedications. The first remodeling was done in the early 1960's, and the building was rededicated by Hugh B. Brown on July 2, 1962. The second remodeling occurred in the early 1990's, and the building was rededicated on June 22, 1991, by President Gordon B. Hinckley. The Cardston Alberta Temple has four ordinance rooms, five sealing rooms, and a total floor area of 88,562 square feet. This page was last edited on 23 January 2012, at 16:10.